As a consumer and Amazon Prime member, I used to rely on reviews. But, now that “fake” reviews outnumber real ones, I rely on good return policies as well. User reviews were extremely useful in making a quick buying decision years ago, but now reviews have to be scrutinized before they can be trusted. That takes time and understanding of the economy of reviews. Note: Scroll down if you just want to understand HOW to spot them, not WHY there are so many. Why are there are so many misleading and fake reviews? Reviews drive sales. Even less-than-good reviews help sell a product. As a result, reviews are a part of brand marketing. Product companies are willing to pay for effective marketing. Unfortunately, that monetary value has corrupted the review system for all of us. As someone who works with dozens of small business owners who sell on Amazon, I fully understand the value of reviews in getting your product seen and purchased. Your product competes with dozens of other products for sales. We’ve seen that you need to get good reviews quickly and continually to show up in searches and get clicks. Ecommerce sites like Amazon were an equalizer for small businesses. While large companies have the established brick and mortar distribution channels and marketing dollars, small companies could benefit from programs like FBA that put their independent products on the same “shelf” as the big brands. Unbiased customer reviews leveled the playing field — until the fake reviews appeared and proved to be an effective marketing tactic. Now the advantage is back in the hands of the companies with big marketing budgets. This hurts small businesses and consumers who are deceived. 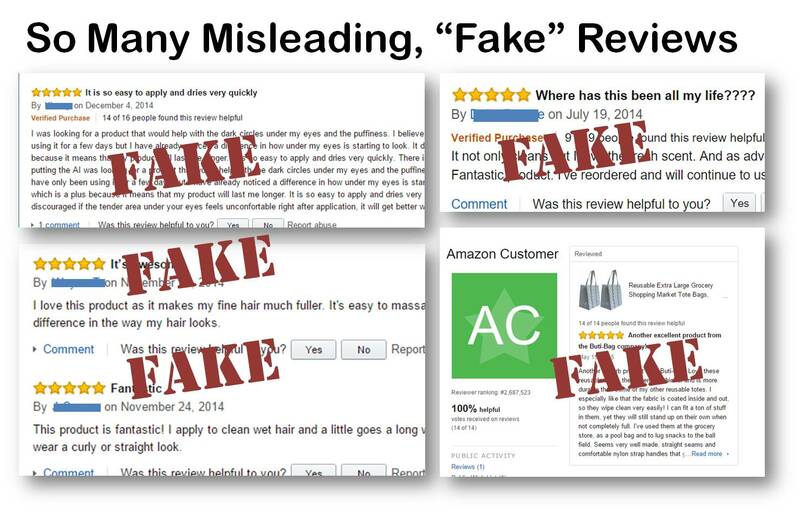 I’m happy to hear that Amazon is cracking down and even suing people for fake reviews. Unfortunately, the group of offenders Amazon is pursuing in this lawsuit is just the tip of the iceberg. Amazon is suing the freelancers who provide positive reviews for a few bucks. These are individuals who may have written hundreds or even thousands of reviews against Amazon’s policy. Specifically, Amazon went after the freelancers on Fiverr where individuals boldly offered to write the fake reviews for payment. This group is an easy target, and hopefully the action against them represents just the beginning of the end of untrustworthy reviews. The Fiverr fake reviews are just a small fraction of the misleading review content on Amazon and other shopping sites. Some of the misleading reviews don’t violate Amazon’s policy. The FTC has also tried to battle misleading content by going after a variety of offenders, but they aren’t able to reach some of the largest sources. The FTC states that online endorsements and testimonials can’t be purposely misleading. 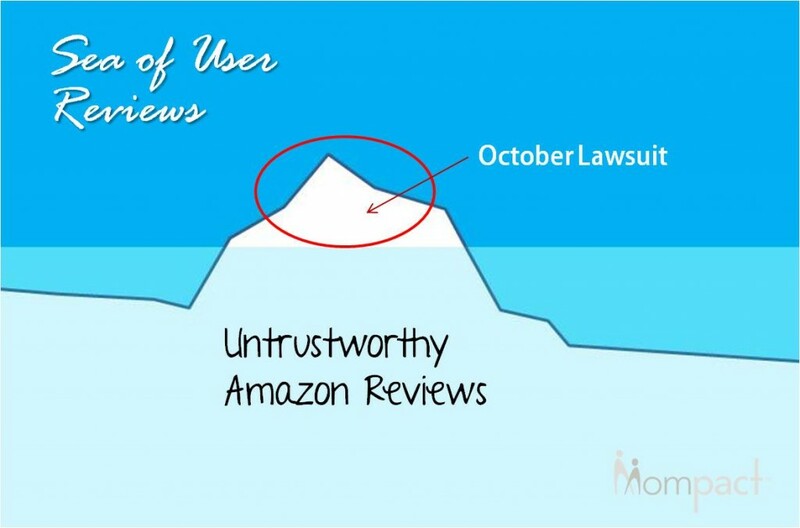 Paid reviewers and endorsers can’t publish fake or unfounded claims. Most importantly, ANY relationship or connection between a company and reviewer must be disclosed. That’s where it gets complicated. There are marketing companies making huge profits selling, err coordinating, the reviews of hundreds or thousands of writers from their individual networks of reviewers and bloggers. These “coordinated” reviews stay within the FTC and Amazon rules because the coordinators tell their reviewers to disclose information and be honest in their reviews. But, I’ve seen the virtual “winks” that go with those statements. I’ve seen how the reviewers are tracked and how they are influenced by knowing that their handling of one review determines their ability to get to do another. (They want others because there is value exchanged — the reviewer receives product or compensation). Whether it is true or not, the reviewers tend to believe that the coordinators from the companies will delete them from the database if they post something too critical. The result is a bunch of legal, but untrustworthy, reviews. Product companies of all sizes and types are participating. Large companies hire huge groups of reviewers, smaller companies leverage their friends, family and fans. Some disclose the relationship, some don’t. It’s frustrating once you see how much of it is happening. The dishonesty even led me to write and file a technology patent to help qualify honest reviewers. But, without the ecommerce sites providing an easy way to know which reviewers to believe, shoppers need to understand what is happening and spend extra time researching and reviewing the reviewers. I’ve seen the small businesses offer free product in exchange for reviews in small groups. Those reviews rarely show up with a relationship/free product disclosure. Amazon is slowly working at that by analyzing relationships of accounts. We’ve seen reviews removed because the reviewer was connected to the product company through social media. Although I don’t like this biased behavior, these “friendly” reviews are a small fraction of the untrustworthy reviews. And, there is a solution. 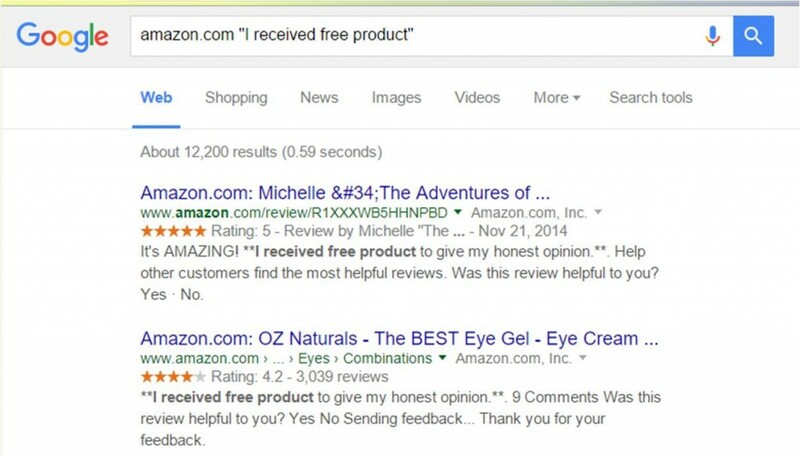 Hopefully, Amazon will find a way to automatically display when a review is associated with a purchase where the product was received for free or at substantial discount — in the same way they currently note if the review is from a verified purchase. The bigger problem (and the source of the larger fraction of untrustworthy reviews) comes from an economy of free products in exchange for reviews. Amazon does allow you to write a review of a free product as long as you properly disclose it. But, those disclosures don’t always stand out. The disclosures are also coupled with phrases like “my honest opinion.” I find that misleading when you look at the problem closely. So let’s look really close. The marketing agencies pitch large product companies, telling them the value of lots of reviews, good or bad. Having a lot of reviews also helps with Amazon search results. The agency doesn’t promise positive reviews, but there are unspoken suggestions. And, it is in the best interest of the agency to provide positive “results” because the agency also sells other marketing solutions to that clients. The company is not buying fake positive reviews, so it is in the clear. When the client signs up for thousands of reviews, the agency emails its database and offers a free product in exchange for a review, being sure to require that the reviewer includes language explaining they received the product free in exchange for an honest review. The agency is in the clear. The reviewer receives the product and writes a positive review. And this is where the problem lies. Why positive? Because they want to stay in the database and continue to get free products for a few minutes of writing. Although it has taken awhile, most of the recent “free stuff” reviews are identifiable because agencies have required the disclosure. But, take a look through the reviews where there are lots of messages like “I received a free product in exchange for my honest review.” You’ll notice there are few unfavorable reviews. So, does this mean only good products need to pay for online reviews? I doubt it. Do a search yourself to see how it works. I just took a quick look yesterday. I went to Google and typed in “Amazon.com “I received free product”‘. I then clicked the top result which led to a specific, very favorable review of a cosmetic product. Clicking on that reviewer’s profile, I found several positive reviews, including others for the same company. All products were given in exchange for a review. This doesn’t mean that this specific reviewer was dishonest. She may love the products. But, she does write enthusiastic reviews and gets free products for doing so. Are “honest reviews” in exchange for free product really honest? Using this same product that came up first in the search, I examined the reviews more closely. With so many, I needed to sort them. 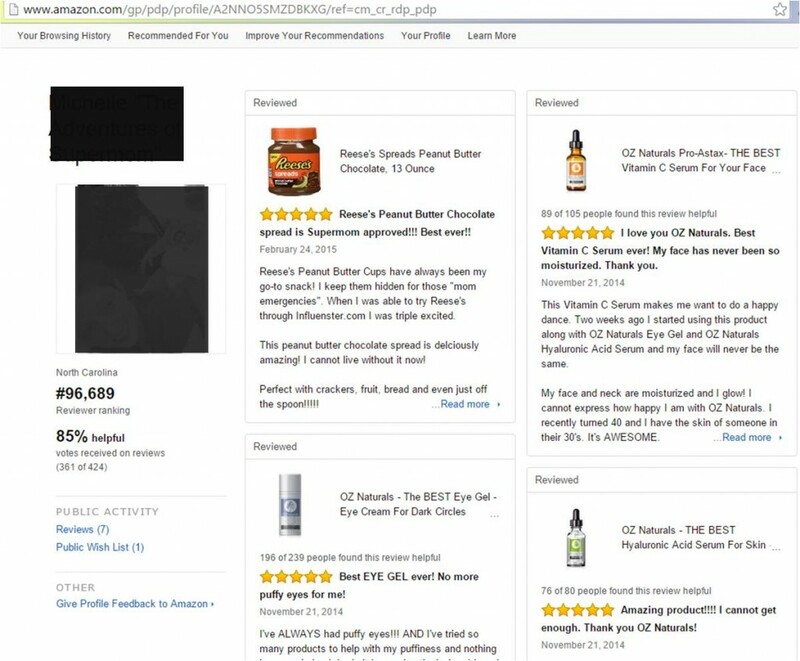 Amazon allows you to do this by going to All Reviews of the product, filtering and searching. There is no single unique phrase that is used when a reviewer receives a free product. Some say “free”, others says “complimentary”, so I used “exchange” as a search term. 536 of over 3000 reviews contained the word “exchange” and, at quick glance, the word always referred to getting the product in exchange for a review. Using “exchange”, I looked at both critical reviews (1-3 stars) and positive reviews (4-5 stars). Overall the product has 3,409 reviews (and this includes other reviewers who received free product but did not include the word “exchange” in their review). Even with the compensated reviews included, the product has only an 80% positive rating, not 97%. If you removed the reviews with “exchange”, the overall positive rating would be even lower. While Amazon is making strides to remove some of the most blatantly dishonest reviews, there are A LOT more that should also be removed, but won’t be, because they (currently) follow the rules. 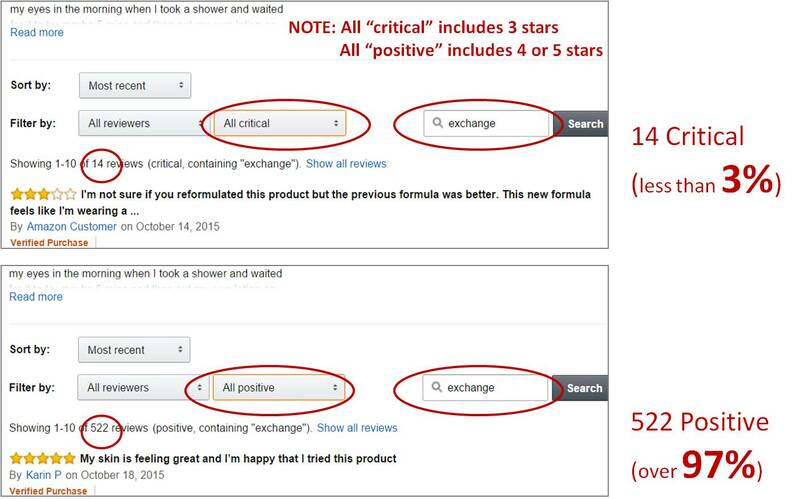 But, Amazon could do shoppers a big favor by marking all these reviews differently. It used to be that you just had to look for “Verified Purchase”, but now you also need to screen out the coordinated reviews. Amazon labels when a review is done by someone who purchased the product from them. Sometimes people review products they purchased elsewhere, but rarely. When you see lots of reviews that do not have the “Verified Purchase” label, be sure to filter them out and assume some of the others are also suspicious. Some products are just great and deserve all top reviews. But, usually there is someone who has a bad experience or just wants to complain. Reviews that are very positive, but vague should be examined closely. Click on the reviewer’s name to see if all reviews are the same. Click on a few positive reviews to see what other products that person reviewed. If you come across several who only reviewed this product, it is most likely the company or their friends and family. See the example above. Search the reviews for words like “exchange” and filter those out, or know that they lean heavily towards the positive. If some disclosed, it is possible that others did their reviews for product but didn’t disclose. Look at the bad reviews for specific problems the product may have. Too Many Reviews Compared to Similar Products. If the product you are looking at has hundreds of reviews, competitive products (which have been for sale for the same amount of time) should have a similar number of reviews. You can go to the oldest review on each product to see when the listing was posted. If a product received dozens of reviews immediately after it was listed, something isn’t right. Unless it was a unique, or highly anticipated product like a new iPhone, that many people just don’t review that fast. It takes time for buyers to receive product, use it, and write reviews. Average people write the way they speak. Do the reviews sound like responses you would get from someone who simply used the product? If they mention model numbers, specific features in marketing language, or seem unnaturally positive, the review is likely fake. Products that have high profit margins (and therefore are “cheaper” to give away) and that are from lesser-known brands are ones that usually need the positive reviews to be noticed. 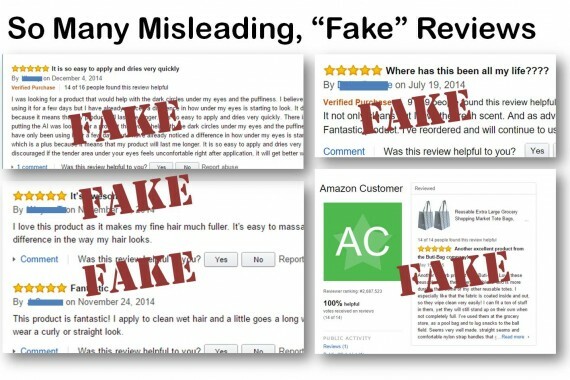 New Hair and Beauty products, especially miracle skin creams and hair styling products from unknown brands are full of fake reviews, especially the kind where companies pay from hundreds of reviews. Vitamins, weight loss supplements, and other high-priced, high promises products are the same. Mass-market products where brand is not important, like cell phone cases and power cords are also commonly promoted with untrustworthy reviews. 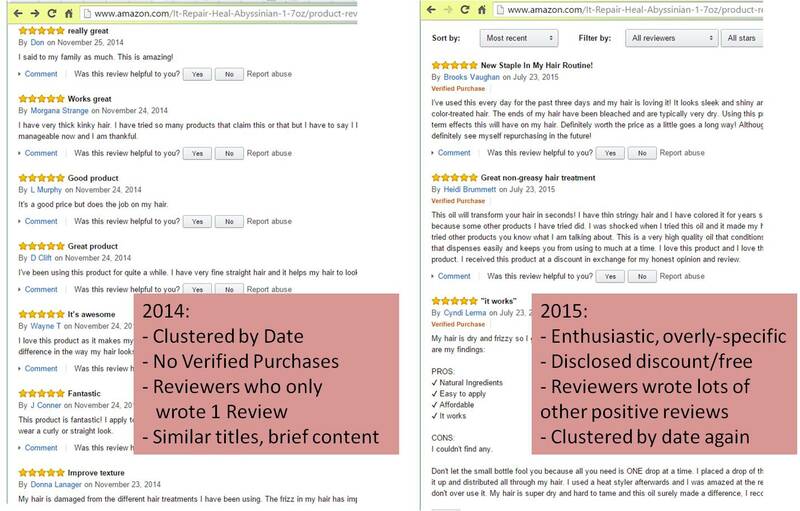 One other area I have seen a lot of abuse is in highly-studied products where lengthy reviews are valuable. Manufacturers of vacuums, appliances and high-end electronics seek out some of the best review writers and find ways to exchange product for positive praise. Here’s a product example that encompasses many of the warning signs of less-than-authentic reviews. It happens to be part of Today’s Lightning Deals, a high-profile marketing tactic that can lead to big sales. I sorted the reviews by date and looked at some of the oldest and some of the more recent. You can investigate the reviewers yourself by clicking on the blue links. The first set of reviews, from just under a year ago, are most likely “fake” people or reviewers who received compensation for writing the review, but didn’t even purchase it (note that Morgana below reviewed several products in November, but none are verified purchases). The second set has received product in exchange for the reviews. You will see that reviewers like Heidi below write many reviews in exchange for product – all glowingly positive. Write real ones! Everyone! Each time an average consumers takes a moment to give an honest opinion, the fake ones are thinned out just a little. 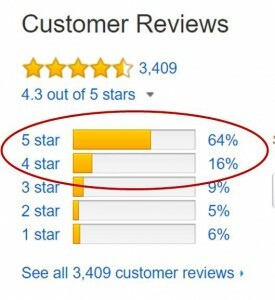 Personally, I’d love to see ecommerce sites do more to inspire honest reviews and mark or eliminate sponsored reviews. Perhaps they could provide points/credits for writing reviews of products you actually purchased. Until they can remove the less-than-honest reviews, Amazon and other ecommerce sites should at least separate or note them. Along with “Verified Purchase” tags on reviews, Amazon could automatically display “Received product in exchange for review”, or “Product received for free/at a discount” when high-value coupon codes are used. 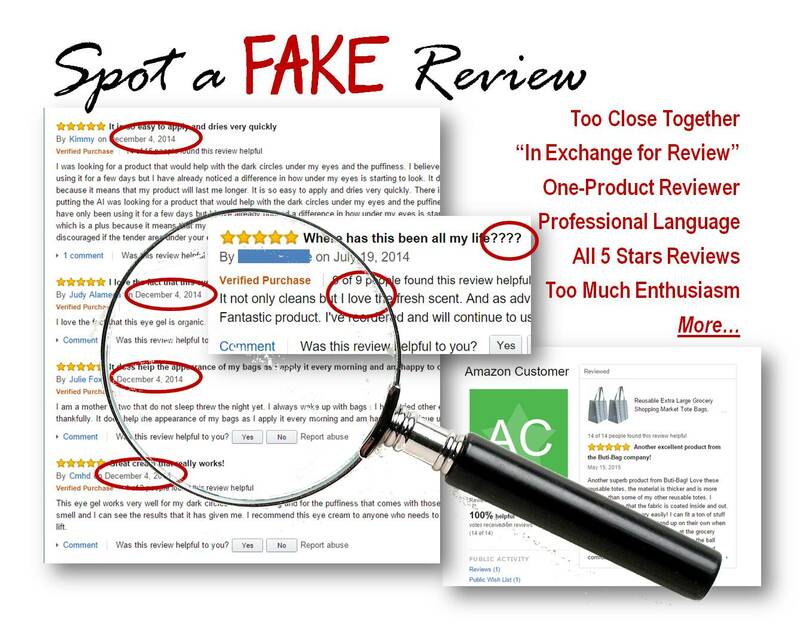 Most importantly, we need to speak up to the e-commerce sites and product owners who allow fake reviews and discourage brands from buying reviews.